MASON, Ohio (Ticker) -- Don't count out Andre Agassi, yet. Agassi continued his resurgence in grueling fashion Saturday night with a 7-5, 6-7 (2), 7-6 (7) victory over fellow American and second-seeded Andy Roddick in the semifinals at the $2.5 million Tennis Masters Cincinnati. Trying to put a disappointing year behind him, the 34-year-old Agassi advanced to his first final since November at the Tennis Masters Cup. The two-time champion of this event will meet 10th-seeded Lleyton Hewitt of Australia in Sunday's final. Agassi, the 11th seed, closed out his 807th career win in impressive fashion, with an ace down the middle that the 21-year-old Roddick failed to touch. The defending champion, Roddick failed in his bid to become just the third player to successfully defend his title at this hardcourt event. Roddick also lost for just the third time in his last 28 matches and fell to 1-5 lifetime against Agassi. Agassi also closed the first set in emphatic fashion, using an ace that was clocked at 115 miles per hour. He had 16 aces on the night. In the second set, Roddick became upset at some close calls, screaming into his towel at one point. But he settled down and dominated the tiebreak, winning the first five points en route to evening the match. The third set was even, with neither player getting a break opportunity. 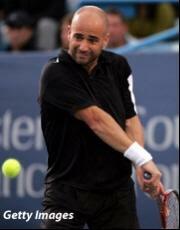 But Agassi dominated the tiebreak, winning five of the first six points before closing out the match. Agassi and Roddick are the last two Americans to finish the year ranked No. 1. Roddick held the honor last year and Agassi in 1999. In Saturday's first semifinal, Hewitt routed unseeded Tommy Robredo of Spain, 6-3, 6-2. Hewitt avenged a five-set loss to Robredo in the third round of the 2003 French Open in the only previous meeting between the players. In his third semifinal at Cincinnati in four years, Hewitt needed just 54 minutes to reach his first Tennis Masters Series final in 16 months. He is seeking his first title since Rotterdam in February.